Each of the over 31,000 memorials we’ve created, from the smallest marker to the most elaborate monument, tells a story. That story is the life and legacy of a person who was loved by many. 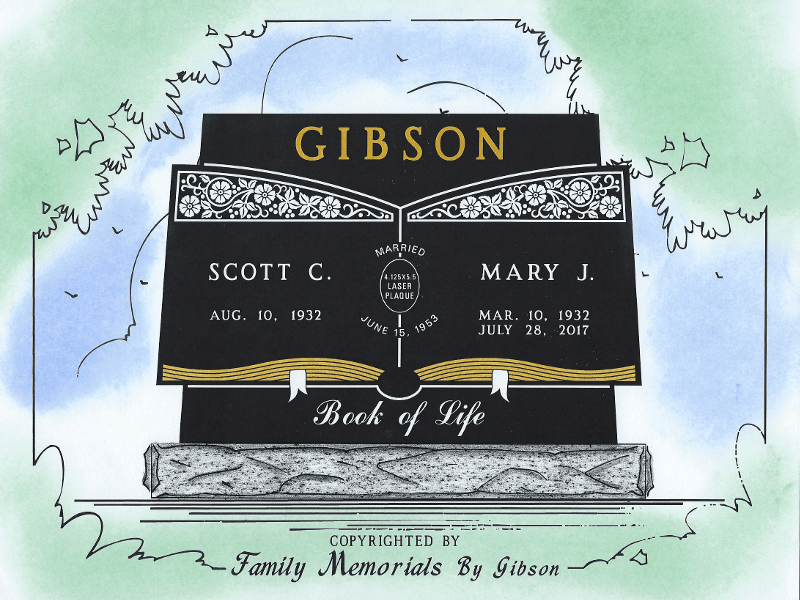 This is our mission: to help every family that walks through our doors capture the story of their loved ones in stone with a unique and customized memorial design. 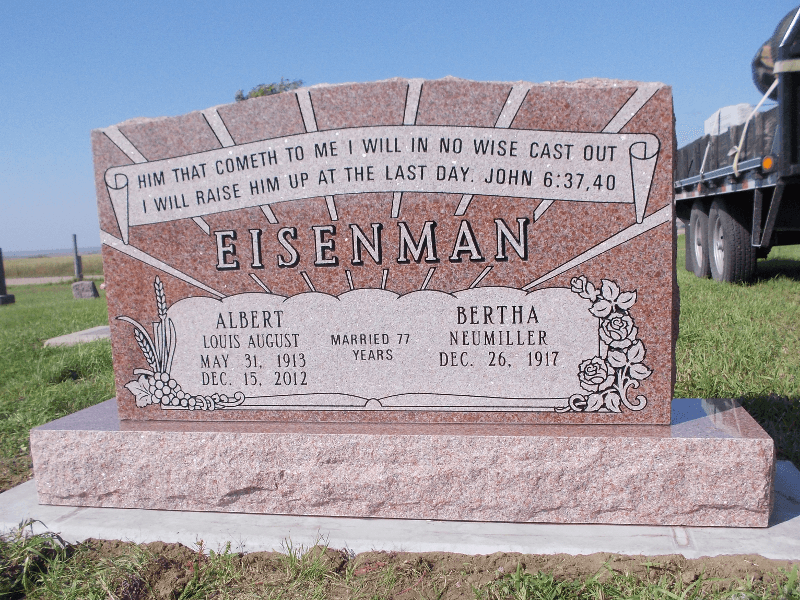 Purchasing a monument for a recently lost loved one can be challenging and intimidating, both emotionally and financially. We understand this and strive to make each family that we work with as comfortable as possible. Our monument experts work closely with each family to ensure we create a monument that honors their loved ones while remaining within the financial limits set out by each family. While the process of purchasing a monument is relatively simple, it can seem overwhelming to many. The remainder of this page will walk you through the steps of purchasing a monument, so you can know what to expect when you decide the time is right. The first thing you will need to do is either visit us at one of our showrooms (Sioux Falls, Watertown, Yankton, Chamberlain, Pierre) or set up an appointment with one of our monument experts. We welcome walk-ins but encourage everyone to set up an appointment if possible. This allows us to make sure you can meet with the monument expert who is most familiar with your area and cemetery (some cemeteries have very specific rules to follow). We will also come to you in your home if that would work best for you! We’re all about meeting you where you are most comfortable. The type of memorial you choose for your loved one will largely be determined by the budget you have available for the purchase. Every family is different, and we like to know what you’re thinking up front, so we aren’t unintentionally pushing you toward something that is out of your price range. We are committed to a no-pressure sales environment! One of the first questions you need to think about will be the style of memorial you’d like. There are many, but the most common are upright monuments, slants, and markers. Some cemeteries have specific rules regarding what type of memorials can go where, so it’s important to be aware of the possible restrictions (our monument experts know all the rules for the cemeteries in their areas). Upright monuments are what the average person imagines when thinking of a memorial stone. They consist of a granite base and a granite “tablet”. Typically, the same color of granite is used for both the base and the tablet, but some families like to mix things up a bit. 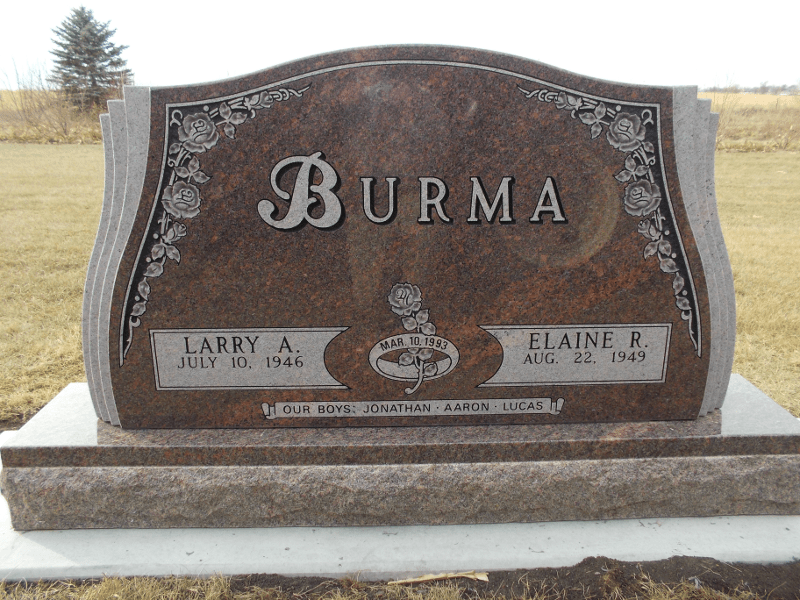 Upright monuments have the most amount of carve-able surface as both the front and the back of the stone can be utilized for lettering/carving. Marker memorials are also extremely popular and offer a simpler, yet more affordable option than uprights. All the inscriptions and carvings are on the top face of a marker which means they can only be read when a person is standing near them. Since there is only one surface on a marker that can be carved, the amount of information that can be put on the stone is usually a bit less than other styles of monuments. Slant monuments are also quite popular and are sort of a “middle-path” between upright monuments and markers, in terms of visibility, carve-able surface area, and price. The primary surface is slanted to allow for easy reading for passers-by. Typically, a slant sits right on the foundation, but sometimes customers will want to set them on a granite base as well. Both the slanted face and the back can be used for lettering and carving on slant monuments. Upright monuments, markers, and slants are just the three most common types of memorials we make. There are many other options to consider as well: benches, ledgers, cremation monuments, mausoleums, field stones, and more. The next task will be to decide the color of granite you’d like. There are thousands of granite quarries all around the world and no two quarries produce the same color of granite. Needless to say, there are lots of options! These are just a sampling of some of the colors we offer! Check out some of our most popular colors! The color of granite also plays a huge part in the overall cost of the monument. The granite that comes from the Americas will tend to be more affordable than granite that needs to be imported from overseas. These are all considerations our monument experts will help you with, so don’t feel overwhelmed! This is an example of what our color proofs look like. This is where we get to start using our imaginations as we tell the stories of your loved ones in stone. Our monument experts will guide you through the process of memorial design within the limitations dictated by the size and color you have chosen. For smaller stones for a single person, this typically includes the family name, given name, birth dates, death dates, and a carving. For larger, two-person stones, you may also be able to include marriage dates, children’s names, and additional carvings. Some other possibilities are to add additional lettering or carvings to the back of the stone (if possible), the use of laser-etching to add a photo-realistic element to the stone (can only be done on black stones), using a porcelain to capture the images of your loved ones, and whether you’d like to have any vases or urns next to the monument. There are also many ways we can honor the military services of your loved ones with a free government bronze or through our own designs and creations. Once we have a good idea of what you’re looking for we’ll send your rough draft to our art department. After a few days, they’ll provide you with a color proof, to scale, (example shown) of what your monument will look like. Upon final approval, and assuming you’ve signed the contract (see next section), we’ll get started. Before we can start doing any work on your stone (aside from the design proofs mentioned above), we need to have a signed contract with half of the total price paid. Many families sign the contract and pay half down right away. This allows us to get the process started as soon as possible. Others like to wait until they have a final design approved. We also offer payment plans to help defray the upfront costs of purchasing a monument. 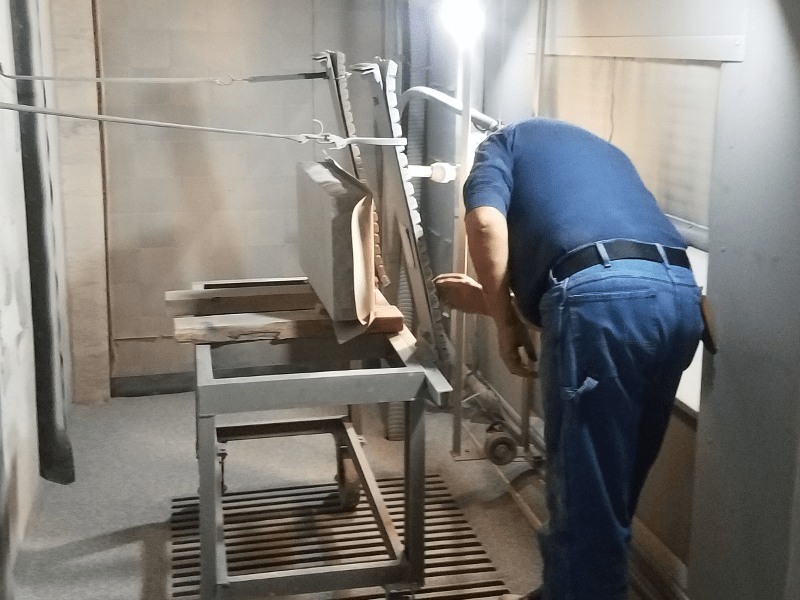 This is an image of Rick working on a stone inside of our sandblasting booth! At this point, the rest is on us. Once we have everything we need we’ll get the process started. If we have the stone in stock, we can get right to carving. If we need to order the stone, the time will vary greatly depending on whether it’s a standard shape or not and whether it’s coming from a domestic or international quarry. It can take up to six months to get a stone from a quarry in Europe, Asia, or Africa. Our monument experts will take care of everything else (dealing with the cemeteries, paying cemetery fees, getting the setting and facing information from the sextant, and whatever else may come up). Once our shop has finished blasting your stone, we’ll put it on one of our setting trucks and our setters will install it in the cemetery. When everything is finished to our satisfaction, we’ll send you a completion letter in the mail letting you know that we have finished our work. Your loved one’s legacy is now set in stone for centuries to come. As we said at the beginning of this page, it’s our mission to work with every family to help them tell their loved one’s stories. We offer a no pressure sales environment and work with you to get you exactly what you want, not what we want! We also guarantee our work with a lifetime warranty. 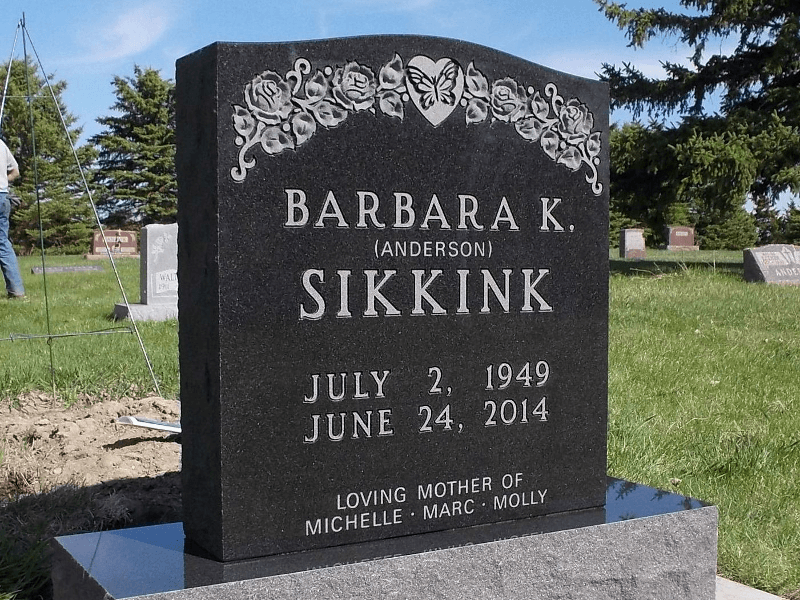 We’ve had countless testimonies from customers who have found an unexpected sense of closure upon seeing their loved one’s stone on their grave. Let us help you, when you’re ready, to get this process started.